Disney may be entering the SVOD market late and without much of its best content, but Disney+ is going to thrive. And while some of the reasons are evident, most remain overlooked or misunderstood. This piece is based on my October 2018 Tweetstorm and is a follow-up to my May 2016 and January 2018 essays “Disney as a Service” Part One and Two. By the end of Q4 2019, Disney will launch its long-awaited SVOD service, Disney+. The service represents an unprecedented gamble for the company – one that’s bolstered by its acquisition of 21st Century Fox (which closed this week), but also intensified by the giant’s $85B price tag (including debt and before select divestitures). Furthermore, there has never been a company of Disney’s size ($60B in revenue, 200k employees worldwide) that has pivoted from a B2B business model (i.e. selling its content to Pay-TV providers, theaters, home video retailers, etc.) into a B2C one (where it sells directly to consumers). This transformation requires not just new skills, such as subscriber acquisition, but a fundamental reorientation of the company – from how it’s organized, to whom it hires, how it invests and which metrics it prioritizes. What’s more, SVOD is a notoriously difficult category to compete in; great content isn’t enough. Technology and product matter (areas that Disney has almost no experience in and has never really needed before), as does focus (which inherently disadvantages a company as diversified as Disney) and a willingness to absorb substantial losses in pursuit of long-term value. And as a public company, Disney will be constantly scrutinized during this pivot, with shareholders expecting the company to rapidly scale Disney+ while maintaining its multi-billion dollar dividend programming and continuing to optimize its many other businesses. Oh, and not only is Disney late to SVOD, but the category leader (Netflix) is essentially unbeatable over the medium term and expected to devour a substantial portion of market value. Despite these challenges, most have come around to at least the viability of Disney+, even if they remain lukewarm on its overall prospects or believe The House of Mouse would be better off simply licensing its content to the highest bidder. I’m particularly bullish on the service for nine reasons. Not all of the reasons are new, but I do think they tend to be downplayed or misunderstood. I also don’t particularly worry about the fact that it’ll take years for Disney to be “all in”, among other concerns. Here’s why. In building an SVOD service, Disney’s greatest advantage and accelerant is widely understood: the company’s IP is best-in-class. But it’s probably (much) stronger than you think. Disney released the highest grossing movies of 2015, 2016, 2017 and 2018 (a record) – with 2019 assured due to Avengers: Endgame (the sequel to 2018’s box office champion) and Star Wars: Episode IX (the sequel to 2017’s). Disney also took home each of the top five slots in 2016 (the first time this has ever been achieved), captured six of the top ten in 2017 (another record) and the top three of 2018. In the last decade, only 35 films have crossed the $1B mark globally. 19 came from Disney and over half of those films were released during the last three years alone. Only four films have ever cracked $2B, two of which are from Disney (in 2015 and 2018). Nine of the ten largest opening weekends in US history now belong to the House of Mouse, as does roughly 25% of the annual box office (again, a record) – even though Disney releases only 10-12 of the 700+ films released each year. And this dominance doesn’t factor in the acquisition of 21st Century Fox, which will add titles such as Avatar (the highest grossing film of all time, with sequels due in 2021, 2024 and 2025) and Deadpool (#9 in 2016 and 2018) to Disney’s IP stores. Disney’s vast IP stores and output also gives the company the ability to improve SVOD performance almost at will. If the company ever needs to shore up lagging subscriber growth (or just decides it wants the service to grow faster), it can simply conjure up a new Marvel/Star Wars/Pixar/Disney series or shift a film from a theatrical release to Disney+. To date, several of Disney’s live-action/animated hybrid remakes, such as Lady & The Tramp and Noelle Claus, have already been moved from Disney’s theatrical schedule in order to premiere exclusively and live indefinitely on Disney+. Shifting titles from the theater to SVOD may, at least in the near-term, cost Disney more in foregone revenue than it would collect on SVOD. But it does mean that Disney can ensure the success of its most important business unit at the flip of a switch. No other service has pocket cards that strong. Unlike digital-era subscriptions and digital services, such as Netflix or Fortnite, Disney doesn’t need to convince consumers to make room in their life (or budgets) for Disney+. They already have. US home video sales of Disney content average $2.6-3.0B per year (a figure that has been flat since 2015, despite the supposed death of home video). This spend is equivalent to 36-42MM annual subscriptions to Disney+ at $6 per month. Put another way, Disney can become a top three SVOD in the US without asking for a single incremental dollar in consumer spend. And it shouldn’t be hard to redirect this consumer spend to Disney+. Few households with tolerable internet access (at least 50% of US homes based on Netflix penetration) will choose to buy a $25 Captain Marvel DVD when they could instead access the film, and dozens of others, plus an assortment of original exclusive series (some of which would feature the character), on any device at any time and for more than four months. Renting, too, seems senseless in the era of Disney+. And just as Disney can shift its feature films to SVOD, it’s likely to swap the home video and SVOD release windows in order to advantage Disney+. Today, Disney’s films spend four months available only by purchase or rental before they shift to SVOD (i.e. Netflix). Once Disney launches its own D2C service, this order is likely to swap. Disney+ will instead be the first place to watch Disney titles after the theater, with home video purchasing and rentals only offered months later. To this end, it’s also important to highlight that Disney only receives a fraction of a fraction of the aforementioned $3B in consumer spend. To point, more than half of this revenue was retained by retailers such as Best Buy or iTunes, and Disney spends hundreds of millions a year to manufacture, distribute and drive those retail sales. With Disney+, Disney gives up at most 15-30% of home viewing revenues by way of App Store fees (it’s more likely the company joins Netflix and Spotify in opting out of iOS and Android billing, choosing only to distribute its app through OS app stores). Furthermore, Disney won’t have to encounter any marginal costs per customer – no DVD, no packaging, no shipping. As a new category, Disney is likely to increase marketing spend for Disney+ by more than it reduces home video marketing spend. However, the returns from this expense should increase – rather than placing an ad to draw the consumer to a single $5 or $25 transaction, it will help to drive a recurring subscription service. Put more simply, the shift to SVOD nets Disney more revenue all the while offering audiences more content, with more convenience and at a lower cost to both Disney and the consumer. This opportunity isn’t unique to Disney, but the studio generates more revenue from home video sales of its theatrical films than any of its competitors – and thus has more to cannibalize, too. Another way to think about Disney+’s realizable opportunity is by considering its most likely customers. And there are a lot of them. The United States has nearly 20MM households with one child under 18 and another 16MM with at least two. Priced low enough, it’s easy to imagine Disney+ achieving substantial penetration in these homes. After all, they’re the households primarily responsible for the ~$2.8B in annual home video spend – and that’s before pricing in the value of original, exclusive Pixar series (e.g. a forthcoming Monsters, Inc. show, various Star Wars series, etc.). Furthermore, there are another 80MM US homes without kids – but they, per the aforementioned theatrical statistics, also tend to be obsessed with Disney content. Marvel, Pixar, Star Wars and Disney aren’t just for families or kids. This doesn’t mean Disney+ will hit Netflix-like subscriber counts (and below, I’ll say why this isn’t particularly important anyhow). However, it’s hard to look at this demographic breakdown, the appeal of Disney’s content across these groups, and the pre-existing spend and conclude that Disney+ will struggle to scale its offering. Disney+ will be undermined by the fact that Disney will lack the rights to key titles for several years after launch. Films such as Avengers: Infinity War or Black Panther won’t be available until late 2020, and it’s not clear if Disney will have any (let alone exclusive) access to the first nine Star Wars films (and two spinoffs) until 2024. And despite its purchase by Disney, 21st Century Fox’s feature films will continue to go to HBO until 2022, with that year’s releases staying on the service until 2023 and 2024 (meaning Disney+ will likely have Avatars 1 and 4 before it gets 2 and 3). This will make it harder for Disney+ to articulate its content offering, undermine IP-based packaging (the service won’t be the home of the Marvel Cinematic Universe for many years, even if it is the home of the Disney Vault) and UI/X (searching via “Captain America” doesn’t work if it only leads to two of his seven MCU appearances), and frustrate those who find out about these gaps only after subscribing. At the same time, Disney’s brand is self-evident and requires no education. Apple, Amazon, Netflix and WarnerMedia (which is also launching a corporate SVOD service at the end of 2019) each need to educate consumers on what their brands signify and sell them on their value. And they also suffer from inconsistent catalogue rights and missing films: WarnerMedia has the rights to the five-title Fantastic Beasts films, but NBCUniversal has the rights to all eight Harry Potter films; Netflix has The Dark Knight Trilogy, but no Batman titles before or after the trio of Christopher Nolan’s films. Premium cable networks such as HBO, Starz, Showtime and CBS All Access, meanwhile, remain exposed (at least when sold a la carte as SVOD services) to whatever their newest original show is – and their success in convincing audiences to stay subscribed after their favorite show has aired. What Disney embodies, offers and represents is not only a simply communicated value proposition – it’s one that’s adored. Everyone loves Disney; all the company needs to do is literally list out which films and series it’ll have and millions will understand Disney+ and want it. After all, a quarter of US spend on film already goes to Disney (soon to be close to 40% including Fox). It’s problematic that it will take years for Disney to reacquire the rights to many Marvel and Star Wars films – not to mention those of Fox (X-Men included). But the flip-side of this challenge is that Disney+ will automatically improve every quarter for years to come (though this also means more in foregone revenue). And not just in volume; Disney+ will continuously add many of the most popular and beloved titles of all time. The company doesn’t even need to do anything. Everyone else? They need to make great content to have great content. Their development pipeline is what will make them successful. And as with pharmaceutical companies, this pipeline is expensive, with long lead times and no guarantee of success. It’s true Disney will still need to make outstanding, direct-to-platform original exclusives. However, catalogue and recently released feature films tend to be significantly more important in SVOD than most assume. HBO’s film library, for example, represents 73% of total viewing across all platform and 34% on HBO Go/HBO Now. 40% of all of HBO’s viewers watch only the network’s film content. And there’s no studio with more valuable theatrical output than Disney. To date, no SVOD service has scaled into the millions without using another, relatively mature business to subsidize its start and drive subscriber acquisition. Netflix, for example, kicked off with 7MM DVD subscribers. Amazon used its Prime subscription, HBO used its Pay-TV bundling, Crunchyroll used pirated content, Hulu used the already-monetized content of NBC, ABC and Fox, and Apple will use the fact they have some 1B active customers spanning several devices each (and the company generates so much profit from other business units it has no need to monetize its originals directly). Disney’s 76-year brand represents a powerful starting point, but more important is the way Disney can use its myriad consumer touchpoints and high-dollar sales to drive SVOD adoption. Buy a cruise or theme park pass? Free year of Disney+. $300 tote bag? Disney+. Buy a DVD or video game? Here’s a three-month free trial. Many will argue this move will artificially inflate subscriptions – and it will. But that’s the point. This approach is common in SVOD, strategically necessary, and ultimately irrelevant to the company’s long-term success. 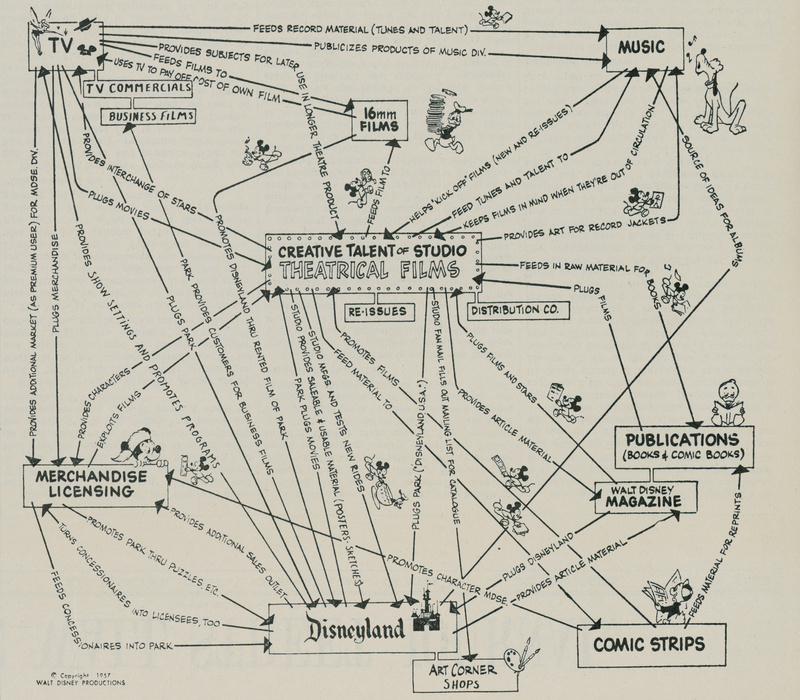 What’s more, Disney has always been an ecosystem company. Disney doesn’t need its SVOD service to be massively profitable – or even revenue maximizing. In fact, Disney has never needed this in any business units. The Walt Disney Company isn’t in the business of selling a video or toy. It is about selling stories and IP that capture value across every media category and countless individual SKUs. 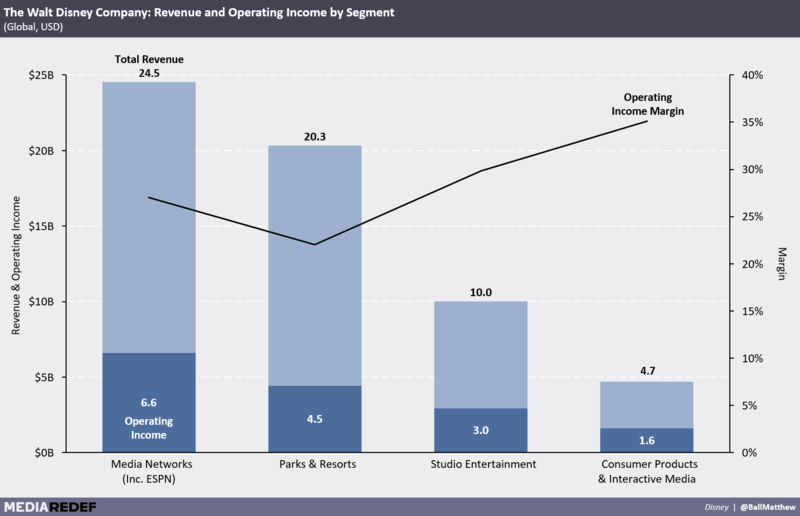 As such, Disney’s Average Revenue Per Family is both far more important and larger than Disney+’s Average Revenue Per Subscription. Accordingly, any focus on what Disney+ charges or even how many subscribers it amasses will miss the point. The real opportunity is how Disney+ enables and grows the rest of Disney’s businesses – from merchandise to live events, mobile games and more. The service will allow Disney, for the first time ever, to know exactly who interacts with their content, how frequently and in what categories, and through which characters – as well as what these subscribers buy, at which (targeted) prices and when. This will be Disney+’s most important achievement, and the math shows why. Today, the core of Disney is its film studio, which is the company’s widest reaching and most consumed channel for Disney’s IP. To this end, the unprecedented success of Disney’s Studio Entertainment division has driven substantial gains across the rest of the company. But critically, Studio Entertainment is far from being Disney’s most lucrative business unit. Disney’s Parks & Resorts business generates twice the revenue of the company’s studio and nearly 60% more in operating income. With Disney Cruise Line vacations costing more than $5,000 for a family of four, Disney+ need have only a marginal impact on cross-selling its subscribers to blow away the isolated lifetime value of a Disney+ subscription. Disney will also be able to use Disney+ to directly sell film tickets (cutting out brokers such as Fandango), reduce the share of its vacation packages that are sold by travel agencies (which also take a large cut of revenues), grow its direct-to-consumer merchandise sales (v. selling through Amazon), reduce its marketing spend via on-platform advertising and user-interest level targeting, and so on. Disney+ should enable Disney to increase consumption of its content, drive additional cross-upsell of its other products and experiences, and improve margins across the entirety of its non-Pay TV business. It can’t do this if it’s disintermediated by a third party in video. Disney+ will serve as the new heart of The Walt Disney Company and, in doing so, transform the company from one that sells one-off toys and films into one that sells a year-round service that spans all media categories, all ages and all demographics; to become Disney as a Service, if you will. And this has been Walt’s very dream for more than sixty years. While Disney+ will initially launch as a video-centric offering, I expect it will eventually go far beyond it. Disney’s ESPN+, for example, also includes access to ESPN.com’s paywalled content and coverage (which, in turn, can’t be accessed without an ESPN+ subscription). In time, Disney+ is likely to offer add-ons for everything else Disney – from comics (e.g. Marvel Unlimited), to ebooks, mobile games, music and even discounts to Disney’s theme parks and merchandise. And maybe even theatrical subscriptions and tickets. To this end, analysts need to look beyond the basic question of whether Disney+ will have enough content to sustain a standalone subscription. Video volume matters, but so too do other features and content offerings. And notably, each additional category expands the bucket of spend that can be cannibalized. For all the optimism, Disney+ does face several obstacles – some economic, others cultural and strategic. These challenges are serious, but they tend to be over-hyped or premature. And they can certainly be overcome. Building an SVOD service will require Disney to pivot its existing business model and invest in substantial losses for years to come. Not only is this risky and expensive, it’s unclear that Disney will be successful – and even if they are, this end state might not be as valuable as Disney and its shareholders hope. Accordingly, many Disney skeptics argue that the company should instead continue to license its library to third parties (a virtually 100% gross margin business model that also requires no capital investment). Estimates here vary based on timing and the impact of the Fox acquisition, but most believe that this could generate between $2.5B in incremental profit in 2019 and as much as $5B per year by the early 2020s. Given Netflix has been operating its streaming service for close to 12 years and amassed more than 150MM subscriptions and $16B in revenue, but still incurs billions in annual cash losses, the argument against self-distribution is certainly fair. Disney is taking on material risk and has an enormously lucrative alternative. At the same time, there is substantially more value in owning both content production and distribution. To this point, Disney’s content has created far more value for Netflix over the past six years than was collected by the House of Mouse. This gap can be narrowed in future deals, but by definition, any licensing agreement means splitting value. If Disney truly is the best content creator, it should be maximizing its economic exposure to its own content. Furthermore, the licensing logic is isolated to the company’s video revenues. As such, it ignores the ways in which Disney can use the Disney+ platform to enhance value across the Disney ecosystem – something that isn’t possible if Disney licenses its content out to third-party services. This doesn’t mean Disney will be successful, but the upside is considerable. And if the company fails, it can always revert to its licensing strategy. Disney+ should have launched years ago. But it couldn’t. Back in 2012 and 2013, Disney entered into so many licensing deals (primarily with Netflix) that it simply lacked the content rights needed to go direct-to-the-consumer before 2019. While Disney has done its best to correct for these mistakes over the past few years, the consequences of this delay remain significant. Disney+ will be launching in a market more saturated than ever before (with the second and third largest traditional media companies also launching their corporate OTT video services within six months of Disney+), needs to spend unprecedented sums just to remain competitive, faces unprecedented fragmentation in consumer attention, and per earlier, will be forced to do so without many of its most valuable titles. What’s more, most believe the OTT video marketplace will support only a few players and offer exponentially less value to those in second, third, fourth and fifth place, and so on. This makes being late particularly dangerous. This dynamic will require Disney to invest even more in Disney+ than it would have needed to in 2016, even though the odds of success have diminished. However, the issue of lateness is more of an issue for those whose catalogues consist mostly of substitutable commodity content. All things being equal, it’s not clear audiences care whether they watch Generic Cop Show X on Hulu, or Generic Cop Show Y on Netflix, or Generic Cop Show Z on WarnerMedia. Indeed, odds are they’d struggle to properly attribute the show’s network anyway. At the end of the day, most viewers are hiring an hour-long drama because they want to spend an hour on the couch or pass an hour on the subway. But audiences love and want more of their favorite franchises – especially those of Disney. Fighting to make Cop Show X or Doctor Show Y a success is very different from The Mandalorian or, say, the further adventures of Buzz and Woody. Not only is there significant pent-up demand for this IP, but the cultural consequence of not watching these shows is much greater. As a result, I’m not too worried about whether, in 2020, audiences will be able to find room for a Disney SVOD service. And after all, that room already exists in home video. There are several reasons why Netflix has been so successful to date: the early licensing mistakes of its suppliers; it’s superlative success with its first slate of Original series; the company’s focus on product and technology; and the fact it was first in and best at understanding the ways digital distribution fundamentally changed what a “TV network” could and should be. But the most important (or proximate) driver may be the fact Netflix needed to win. It had everything to gain from success and everything to lose from failure. Not only was there no emergency parachute, there was nothing holding the company back but its own conviction and execution. These stakes meant more than a willingness to take risks. Most importantly, it meant the simplification of its corporate mission (hence Netflix defunding its DVD business), as well as its prioritization and decision-making processes. In a fast-changing sector like OTT video, this simplicity matters. However, Disney will not really be “all in” on Disney+. At least not for the near future. Unlike Netflix, not all of Disney’s divisions – not even the content divisions – will be rallied behind SVOD. The theatrical window will still be prioritized, networks such as ABC, FX and Freeform will continue to receive many of the company’s most promising TV series, the company will likely continue to sell DVDs and electronic downloads/rentals (something Netflix doesn’t do), etc. At the same time, it’s not clear Disney needs to blow up its existing businesses yet. Linear TV is so barely watched these days among target viewers that for most subscribers, Disney XD or ABC content will feel “first run” on Disney+. If AMC’s Breaking Bad is widely seen as a Netflix Original because Netflix was where most viewers watched it, then the same will apply to Disney’s linear shows when airing on Disney+ (or Hulu). In this case, advertisers and Pay-TV providers will effectively gift Disney+ with a constantly-growing catalogue of effectively “free” (or at least heavily subsidized) content through which they can build an ad-free D2C empire. Netflix can’t be credited for this tailwind while Disney is critiqued. This same logic doesn’t apply to Disney’s theatrical films; Avengers: Endgame would have more value to Disney+ if it were exclusive to the platform then if it were first released in theaters. However, Disney’s approach to feature films isn’t as binary as prioritizing theatrical or SVOD. The company has already shifted several titles from the former to the latter. And going forward, it seems likely that films similar to 2018’s Christopher Robin and Mary Poppins Returns will be SVOD-releases, not theatrical ones. Furthermore, Disney will continue to use its theatrical films to launch Disney+ spinoffs. The demand for a Scarlet Witch or Loki TV series would likely be far lower were it not for the fact these characters spent years popularized via feature films such as The Avengers. And finally, it’s likely that the decision to fully collapse the theatrical v. SVOD release model is already in process. In the coming years, Disney will continually receive data on the value of direct-to-SVOD releases and shortening the wait between a theatrical release and Disney+ availability. And at the same time, the company’s focus on Disney+ will only grow. This will inevitably lead to a more hybridized release model – say as a three-week theatrical window for The Avengers 6 before it hits Disney+. But it will take time for the market and Disney+’s economics to support such a move. This will limit medium-term adoption and pricing, but it will also sustain $3B per year in operating income (more than Netflix loses). These profits will allow for significant additional investment and risk-taking in Disney+. At a macro-level, Disney’s ability to manage its existing business while enabling its newest to thrive comes down to whether one has faith in the leadership of Bob Iger. Disney+ represents the largest culture shift in the company’s history – and one of the biggest pivots in blue-chip history. But Disney and Iger have proven themselves adept at cultural adaptation – as the acquisitions of Marvel, Pixar and Lucasfilm show, not to mention the quasi-merger of Walt Disney Animation Studios with Pixar and the Disney-Fox merger. This doesn’t mean Disney doesn’t face serious internal challenges – managing conflicts between the SVOD and home video teams, adapting historical compensation incentives to a world where SVOD is the largest priority, making it clear that the most important functions of Disney’s past (e.g. affiliate sales) will play only a small role in its future, etc. But until proven otherwise, it seems imprudent to bet against Iger’s ability to manage this. Challenge #4: Et Tu, Hulu? The final prominent criticism focuses on the fact Disney plans to operate and scale both Disney+ and Hulu worldwide. This stems from the fact that one of the enduring lessons of the OTT video era has been that audiences actively prefer aggregation of content, rather than cable-style fragmentation of different genres and styles across different networks. To point, there’s no Netflix subscription for kids, just a section of Netflix with kids content (and its own UI). Nor is there an additional fee for nature documentaries, premium movies or anything else. There’s just Netflix. Disney has argued the distinctiveness of the two brands justifies the split. This is unclear. Disney+ is being positioned as a “family service” while Hulu is “general entertainment”. However, Disney’s feature films are, by definition, general entertainment. You can’t pull in the company’s box office results by just appealing – or even primarily appealing – to families. In addition, brand fragmentation will persist. Deadpool, a decidedly R-rated Marvel title, will go to Hulu – not Disney+. In addition, Hulu is developing a series of other all-audience Marvel titles exclusively for its service. This is confusing. And it’s not clear how many potential SVOD buyers aren’t being targeted by both. Similarly, Iger has argued Disney+ will have a unique character/IP-based navigational experience, but Netflix also offers a character/title-based UI. As such, it’s not clear you need separate services to do this. Operating two services also means paying to re-acquire the same customer twice, splitting or diluting programming focus (Hulu’s primary growth need might be kids content, but Disney+ might be the highest point of leverage for this type of content), redundant technology investments, partially fragmented data, added decision-making complexity (e.g. which service gets the extra $1 in investment), etc. In addition, many wonder why – in 2019 – Disney would rather start from zero subscribers than with Hulu’s 25MM+ subscribers (even if they use the latter to bundle Disney+). And for what it’s worth, Hulu doesn’t yet have the scale to generate a profit (nor does Netflix US, with 60MM subscribers for that matter). Disney’s library would instantly supercharge the scale of its SVOD sister. 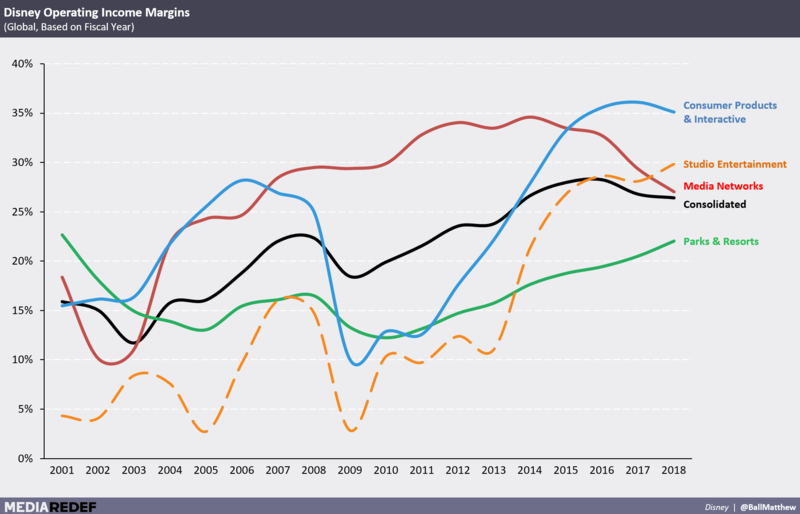 Ultimately, the cost of this bifurcated strategy isn’t yet clear and primarily speculative and/or based on the strategy of a single leader: Netflix. Certainly, I’ve yet to hear a compelling reason to believe operating both services will fundamentally erode or destroy Disney+. What’s more, one can just as easily generate reasons why the split may also be an aid. Hulu’s brand is 2nd or 3rd to Netflix in the United States and unknown abroad, Disney is second to none everywhere. And given Hulu’s diverse content library, rebranding it to a Disney derivative makes little sense. The two services may make programming decisions more complicated, but they will greatly simplify how Disney+ is used to drive the rest of the Disney ecosystem. This is probably more important. And at the end of the day, Hulu won’t be ready to go global for years. Disney+ will be available in select markets worldwide by the end of this one. Since its inception, Disney has been about storytelling. The primary outlet and core of these stories was theatrical films, which were distributed by a third party, and popularized IP that was repacked into other content, products and experiences… most of which were distributed by third parties and tied in barely at all. But it still worked. What makes Disney+ so significant is not the fact it shifts the business from B2B to B2C, or from linear TV to OTT. Instead, it’s the ways in which a direct audience relationship will change what the company makes, by whom, and to what end. The greatest story Disney has ever told might just be unfolding live.